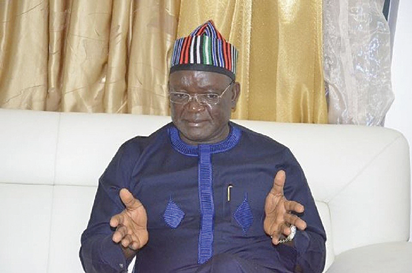 Governor Samuel Ortom in this interview reacts to the public apology recently tendered to the people of Benue State by Senator George Akume over his role in the emergence of Ortom as governor in 2015. How do you react to the apology of Senator Akume on his alleged role in making you governor in 2015? He should be apologizing to the people of Benue State for his ineptitude and non-performance. As a senator for 12 years, what did he do? He should be apologizing to Benue people for joining hands and collaborating with our enemies to fight us in the state. He is a loner and I will also apologize that I worked with him and it was because I worked with him that he became senator for the third term because he was going to lose that election. That was why he waited and insisted that I must be the candidate of that party. And you will see what will happen in these elections that are coming up now that I am not with him. You just performed a swearing in ceremony of acting local government chairmen. Some people have attributed this to politics rather than the offenses that the suspended chairmen have been credited with. How would you react to this? As long as you are doing politics in line with the laws of the land, there’s no offense. It is when people are lawless that I complain. Whether politics or not, the law must be obeyed and due process must be followed which is what we did. We have fulfilled all righteousness as far as the law establishing the local government is concerned. So, if somebody points out to me that this is what I have done which is wrong, I will talk about that. But as far as I am concerned, we have done the right thing. There was a restraining order in the past and so, we couldn’t go ahead to suspend them though there were petitions against them and we had to verify that these facts were there but now that the restraining order was discharged, we are right. If we waited for three months because we are law abiding, we should be appreciated. There’s no politics here. We are doing the right thing. Are you aware of the statement by the Minister of Information, Lai Mohammed that Benue has been marked as one of the states that will witness crisis ahead of the General Election? That is their game plan. You know, this is not the first time that they are coming out with this. They have been planning this for a long time that they will cause crisis themselves. The Federal Government is planning crisis, they are planning to send herdsmen and instruct the security men not to contend with their terrorist acts so that there will be crisis. But it is left for Nigerians to know. You heard what former President Obasanjo said, the truth is that Buhari is no longer in charge of the government. It is the cabal that is running this government and it is very clear. You heard what the First Lady said that we should rise up to fight the cabal. We did not elect the cabal into the villa to do what they are doing against us. So, it is clear and I’m not surprised about the statement coming from the federal government that Benue State is marked. At least, we have relative peace today but they intend to cause crisis themselves so that they will make the state ungovernable and so on and cause our elections to be inconclusive so that at the end, they will come and intimidate us. Nobody will intimidate Samuel Ortom and all of us in Benue State here. I am with the people and the people are standing with me. I will do it with the last pint of my blood as long as it is lawful. Nobody will intimidate me. You have just admonished the people of the state that after voting, they should stay back and defend their votes. But INEC is saying that after voting, people should leave. Don’t you think this will cause conflicts? Well, we will have to defend our votes. If you leave the premises, you stay somewhere and watch and see what will happen. That is the point. You stay back and if they want to short-change us, we will resist it. If you do the right thing we have no problem even if we lose. All that we are seeking is justice, fairness and equity for everybody irrespective of party affiliation. That is what I stand for. It is justice that I’m calling for and I can fight that one to the end.